The famous waterfalls of Niagara River is set between the state of New York and Toronto, Ontario in Canada. There are three sections to Niagara Falls which are the Bridal veil Falls, the American Falls and the Horseshoe Falls which is located on the Canadian side. The Canadian side of the falls are the most visited side of this natural wonder due to the amazing views from this side. The American side of the falls also offers some spectacular view of the Horseshoe Falls while if you are visiting the Horseshoe Falls you will be able to take in the views of both. The Horseshoe Falls drop to an astonishing 53 metres and are approximately 792 metres wide. The American side on the other hand is slightly smaller at 21 metres deep and 323 metres wide. There is much to see and do apart from just visiting the Niagara Falls, you can go on a jet boat tour, visit one of the areas museums such as the Niagara Aerospace Museum. There are a variety of fine places to rest your head while you are here as well as a large choice of restaurants. Below are a selection of Attractions located in Niagara Falls, United States. Alternatively, you can browse through all Niagara Falls Attractions. Below are a selection of Guesthouses located in Niagara Falls, United States. Alternatively, you can browse through all Niagara Falls Guesthouses. Hillcrest Inn Bed & Breakfast is a Guesthouse located in . Offering a full breakfast each morning, this Niagara Falls B&B is 13 minutes’ walk from Prospect Point, overlooking the American falls. Terrapin Point, overlooking the Canadian falls, is 1.5 km away. Consider Butler House Bed and Breakfast for your next trip to . 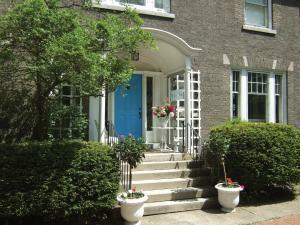 Featuring a shared terrace and scenic gardens, Butler House Bed and Breakfast is located in Niagara Falls. A hot breakfast is served each morning. Air conditioning and a flat-screen cable TV are included in each uniquely furnished guest room. The Little Italy of Niagara Falls Bed & Breakfast is located in . The Little Italy of Niagara Falls Bed & Breakfast is situated in Niagara Falls, 300 metres from Niagara Falls Culinary Institute and 2 km from Aquarium of Niagara. Every room comes with a private bathroom equipped with a shower. Below are a selection of Hotels located in Niagara Falls, United States. Alternatively, you can browse through all Niagara Falls Hotels. Seneca Niagara Resort & Casino is a Hotel located in . This New York hotel is less than 1 mile from Niagara Falls and boasts an on-site casino, spa, and various dining options. Shopping and dining in central Niagara Falls, NY is 2 miles away. Consider Red Coach Inn for your next trip to . Overlooking the Niagara River, this historic inn is located just 5 minutes’ walk from the American Falls. Facilities include an on-site restaurant and uniquely decorated rooms with free Wi-Fi. Sheraton at the Falls is located in . Located in the heart of downtown Niagara Falls, Sheraton At The Falls is directly connected to the Seneca Niagara Resort & Casino and adjacent to The Conference and Event Center Niagara Falls. Free Wi-Fi access is offered throughout the hotel.